Since embarking upon a very restrictive diet, I’ve replaced salad dressings and sauces with exploring the world of salsas. Pico de gallo is by far my favorite and adding a little fruit, such as peaches or mango, makes for a low-calorie delicious and colorful topping for salads, chicken, pork loin, or fish. 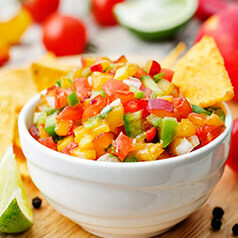 Simple yet versatile, I love having a batch of fresh pico in my fridge to pull out throughout the week. Dice all vegetables and place in a large mixing bowl. Pour lime juice and olive oil over. Sprinkle with salt and pepper; stir to combine.